The mysterious Viennese artist noise impro band known only as BeAUtIes Of The NIgHT returns to Berlin to support their most recent release „Use Filters“ on Vienna’s qed label, as well as their brand new tape release „Youtube Classics Vol. 1“, released on Ratrights. 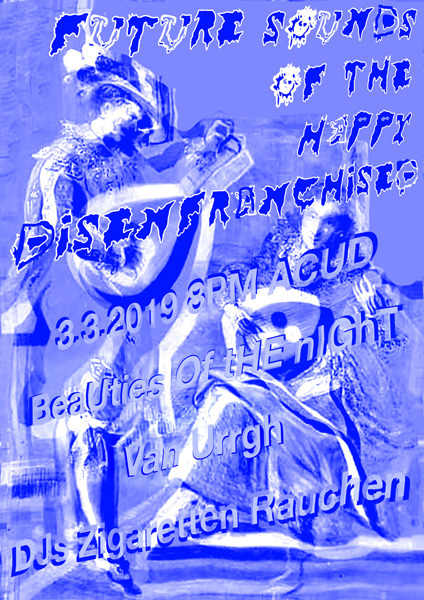 The night will be opened by the Berlin band Van Urrgh playing loud secrets. DJ Team Zigaretten Rauchen (starship magazine etc.) will provide excellent DJ duties as well. … strive for an intense and noisy embrace of the audience, composing its outfits rather than its song structures, songwriting or rehearsing. It seems that no matter what comes into their minds on stage, evil noise rock results. In very pointed and significant ways Beauties of the Night approach the genre-specific problem related to any kind of rock music – namely, the problem of desiring portrayal and representation, while at the same time wanting to erase both in order to achieve a breakthrough to the authentic. Members: Christian Egger,voc/dr, Manuel Gorkiewicz, git/voc, Markus Krottendorfer, b/voc, Alexander Wolff, git/voc.